Schuld (which means Guilty) is a free psychological horror game of German origins created by Kelven. 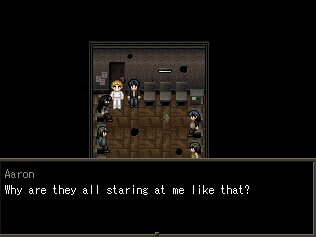 Just like Ib and Ao Oni, this game was created with RPG Maker and contains a surreal, intense atmosphere that is less scary and more spine-chilling than in the aforementioned games. The game world manages to have a Silent Hill 2 vibe to it, seeing that the main character is a man that arrives in a place without any memory of why he needed to go there and the feeling that it looks familiar. Packing just a book entirely blank except for a page with the seven deadly sins, this man has to explore the surroundings and discover what’s going on. And it’s not pretty. In the first minutes you’ll find a river of money and discover that even if you’re rich, money has completely lost its value. The next shock will be even more horrifying and put a little more sense to this dying, rotting world. Schuld has a pervasive atmosphere and some nice puzzles, as well as a few action sequences. It’s completely linear and won’t take more than an hour or two to complete, but it manages to get under your skin and make you feel like this horrible world won’t one day be the one we’re living in. Recommended for fans of horror games that aren’t frequently throwing jump scares at you.